Our version of the Poncelet water wheel is a revolutionary development of a forgotten 1820's technology. It is an efficient device for converting the kinetic energy of flowing water into usable electricity. The wheel is made from stainless steel and is suitable for domestic or commercial sites producing up to 100kW. 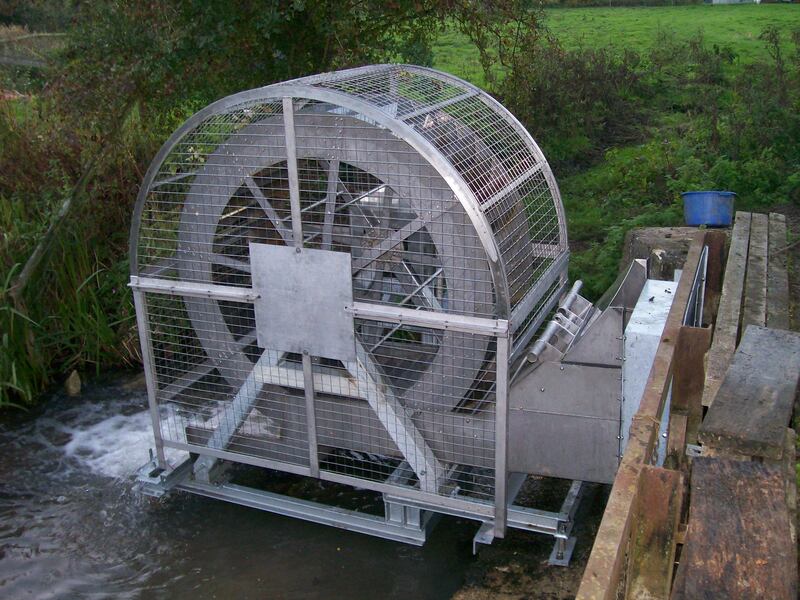 The Poncelet water wheel is designed by ourselves and manufactured here in the UK and is installed simply and easily with minimal construction work. Owing to the interest shown in our Poncelet Wheels we have now included design, manufacture and installation of other traditional forms of water wheel (i.e overshot, breast shot, Zuppinger) and also higher head turbines. We can also provide bespoke and hybrid water wheel designs where required. To establish if your site is suitable for generating electricity from a Poncelet Wheel you need to have flowing water and you need to know the three key components, which are WATER VELOCITY (in metres per second), AREA (in square metres) and HEAD (in metres). Most turbines work on an efficiency of up to 70% (greater efficiencies can be obtained from our Archimedes Screw) using this efficiency value (i.e. 0.7) would give you the expected output from the site.